Aosta is located in the northwestern corner of Italy in the center of the Aosta valley, bounded by Switzerland to the north and France to the west. The Valle d'Aosta region is the smallest of Italy's 20 regions. Aosta is about one hour from Turin (Torino), 30 minutes from Milan and Malpenso Airport, and 1.5 hours from Geneva, Switzerland. The A5 Autostrada links Aosta to Milano, Torino, and Courmayeur. There is a train station in Aosta - Stazione de Aosta. It is an easy walk to shopping and the historic center from the train station. Directly in front of the station is Piazza Innocent Manzetti, where you'll find connections to most of Aosta's urban bus lines. Aosta dates from about the third millenium BCE, when it was a megalithic settlement. Around 25 BCE it became a Roman military colony hosting Emperor Augustus' troops. Its strategic position made it a magnet for the invading hordes--Burgundians, Ostrogothes and Franks among them. In 1302 Aosta became a dutchy of the kingdom of Savoy. The historic center of Aosta contains some quite well preserved Roman structures. Mont Blanc, Monte Rosa, the Matterhorn, Great Saint Bernard, Gran Paradiso are the giants of skiing near Aosta, but there are many other ski resorts nearby (see the map link in the linkbox below). Aosta is laid out in a grid pattern thanks to the Romans who inhabited it. Walking around the historic center is easy - no cars are allowed. The Hotel du Pont Romain Cecchin in Aosta was built into a Roman bridge. If you go, ask to see the cantina at breakfast, it's actually part of the bridge. It was also reasonably priced and very clean. Mr. Cecchin, who you'll see when you check in, was an Italian boxing champion in the '50s, and the dining room has proof in photos. Aosta has many fine places to ski in winter, so there are many vacation properties available. See: Valle d'Aosta Vacation Rentals (Book Direct). The regional heifer head-butting championships have been going on here since the 17th century. It's a huge event held in Aosta on the third sunday in October at the Croix Noire Stadium. The owners of the winning cow get feasted and presented with barrels of wine. A large Aosta crafts fair featuring music, plays, and dances held on the last two days of January since year 1000. Aosta is an interesting city that tourists have yet to discover. We drove around it for a while without finding the historic center, finding later that you really have to get out of the car to find it. Once inside, Aosta makes a fascinating stroll where you'll find a huge central piazza, lots of evidence of the Romans interwoven with the more modern (medieval) buildings, and plenty of cafes to sate your thirst or hunger. the Arco d'Augusta honors Augustus, who gave his name to Augusta Pretoria, the towns original name. The Roman Theater was restored as of 2003, while the Roman Forum, beneath ground level, is visitable. The Tour Fromage (the Cheese Tower) is alongside the Amphitheater and currently hosts art exhibits. 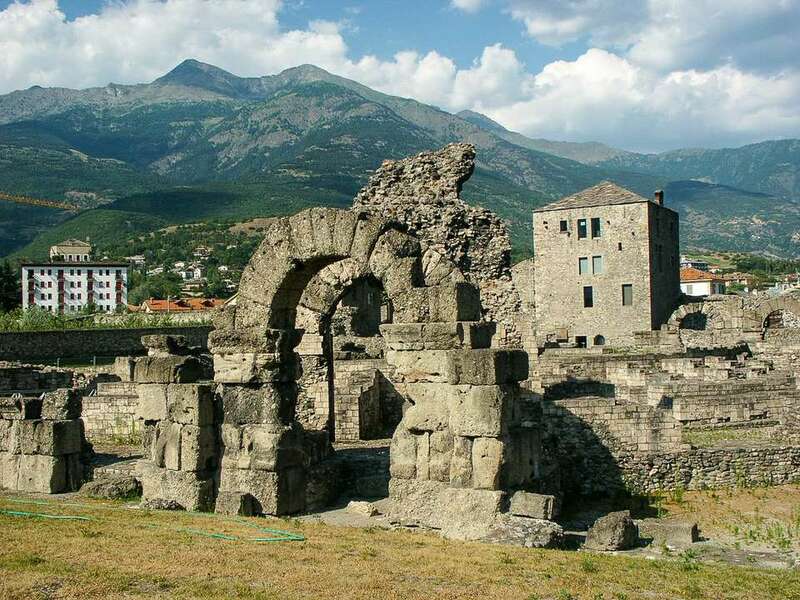 Other Roman ruins are scattered about Aosta as they are in Rome. The Main Piazza in Aosta hosts one the Italy's top historic caffes, the Caffe Nazionale (closed Monday), in operation since 1886. Long ago there was a church on this site, and there is actually a chapel inside, built as a private sanctuary for the dukes of Aosta. See our Aosta Picture Gallery for pictures of Aosta.